Thank you for your visiting and your interest in NoteBurner products! 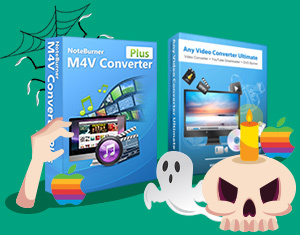 NoteBurner 2016 Halloween Special Offer is over now. To get the latest news of NoteBurner products and promotion campaign, you can just visit NoteBurner homepage. 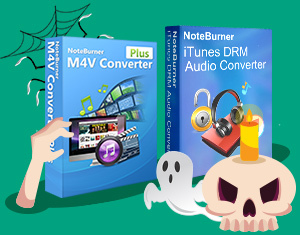 NoteBurner Apple Music Converter ( For Mac & For Windows ) is specially designed for users to convert Apple Music files, audiobooks, iTunes music or other downloaded M4P music, to MP3, AAC, FLAC or WAV format. It can convert all audio files at unbeatable fast speed and keep ID Tags information. And the quality of the output audio can be as excellent as CD Quality. 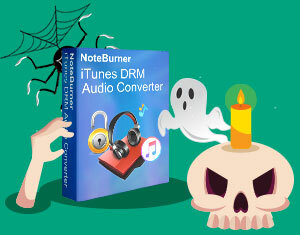 NoteBurner iTunes DRM Removal Suite can remove DRM from both iTunes videos (including iTunes Extras) and Apple Music songs at unbeatable fast speed with lossless quality. With these two tools, you can not only download/record/convert normal DVD/video/audio, but also remove DRM from purchased or rented iTunes movies to enjoy your movies on any devices and keep iTunes rentals forever. 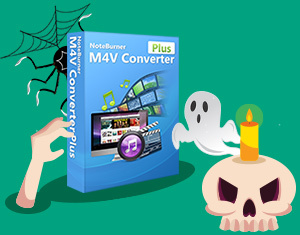 NoteBurner M4V Converter Plus (For Mac & For Windows) is an ultimate DRM M4V Converter which helps you remove DRM from iTunes videos (both purchases and rentals) and convert to common video formats with all audio tracks, subtitles and AC3 dolby 5.1 surround retained 100%. Remove DRM 20X faster with 100% lossless quality. 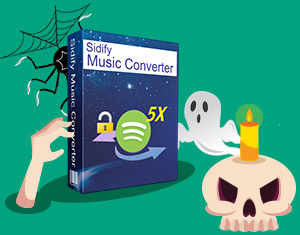 Sidify Music Converter for Spotify (For Mac & For Windows) is simply the best choice for those who wish to remove DRM from Spotify music, because it allows to strip off the DRM from any Spotify Music and keep original quality of the audio. After removing DRM, you can enjoy Spotify music on your iPod, iPhone, Zune, PSP, MP3 player, etc.